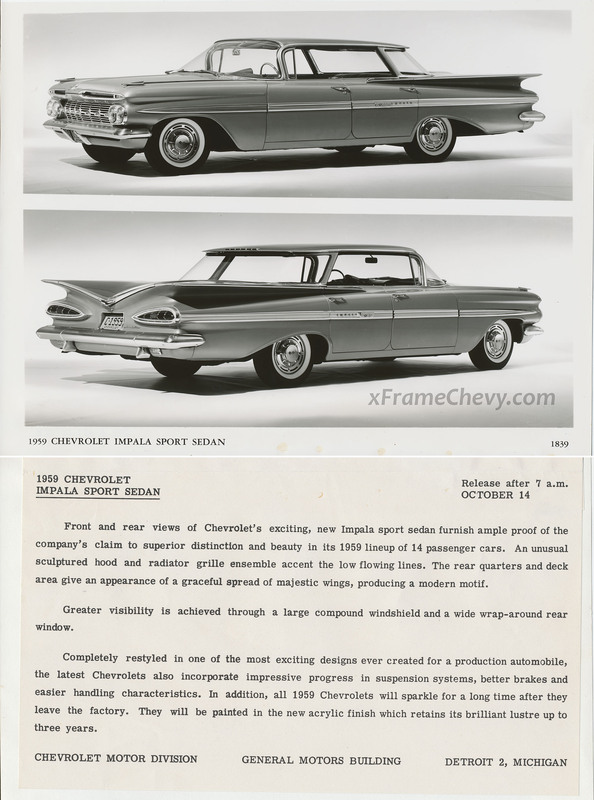 These two photos from GM Photographic were originally sent to the media in October of 1958 to be published in newspapers and other advertising. They are 8×10 prints made from high resolution negatives, so they contain a lot of crisp detail. The car represented here is a 1959 Impala 4-door Sport Sedan, nicknamed the “Flat Top” for its flat saucer type roof. Notice that this car has an emblem on the rear next to the right side tail-light indicated that it was equipped with Level Air suspension, a very rare option. 1959 CHEVROLET – Release after 7 a.m.
Front and rear views of Chevrolet’s exciting, new Impala sport sedan furnish ample proof of the company’s claim to superior distinction and beauty in its 1959 lineup of 14 passenger cars. An unusual sculptured hood and radiator grill ensemble accent the low flowing lines. The rear quarters and deck area give an appearance of a graceful spread of majestic wings, producing a modern motif. Greater visibilkity is achieved through a large compound windshield and a wide wrap-around rear window. Completely restyled in one of the most exciting designs ever created for a production automobile, the latest Chevrolets also incorporate impressive progress in suspension systems, better breaks and easier handling characteristics. In addition, all 1959 Chevrolets will sparkle for a long time after they leave the factory. They will be painted in the new acrylic finish which retains its brilliant lustre up to three years. 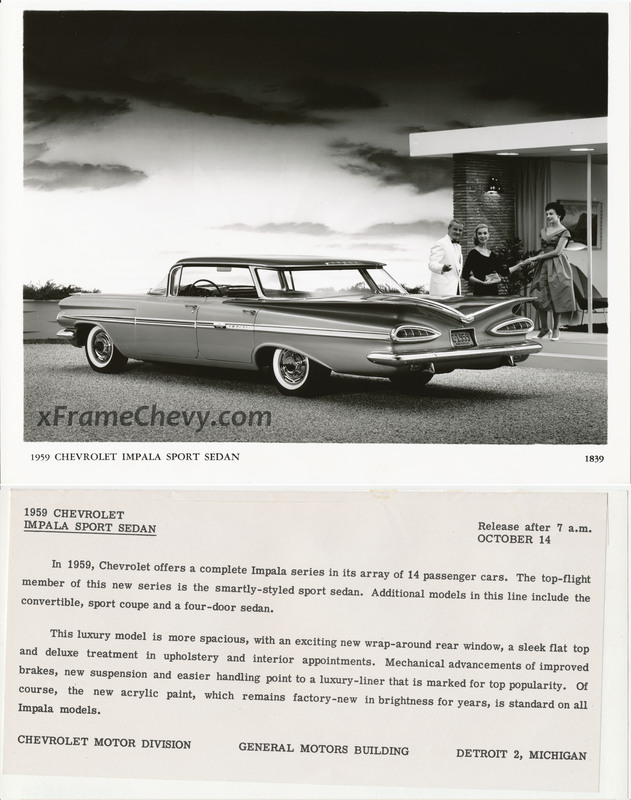 In 1959, Chevrolet offers a complete Impala series in its array of 14 passenger cars. The top-flight member of this new series is the smartly-styled sport sedan. Additoinal models in this line include the convertible, sport coupe and a four-door sedan. This luxury model is more spacious, with an exciting new wrap-around rear window, a sleep flat top and deluxe treatment in upholstery and interior appointments. Mechanical advancements of improved brakeds, new suspension and easier handling point to a luxury-liner that is marked for top popularity. Of course, the new acrylic paint, which remains factory-new in brightness for years, is standard on all Impala models.